NYT: I see there is controversy over the design of the official Olympics logo, which is based on the Inuit stone marker known as an Inukshuk. DC: Inuit culture is north of here, in the Canadian Arctic, and it has nothing to do with the lives of anyone in British Columbia. If you want to use the First Nations motifs for your logography, use the ones that are actually from here. A lot of people are kind of cheesed off. I voted against these Olympic games in the city plebiscite back in 2002. Now that they are nearly here I am extremely annoyed by their crippling social and financial costs, their corporate profiteering and their draconian trouncing of free speech. However if they’d had a beautiful design presence in the City, I could have put politics aside and at least given them credit for that. Instead, Vancouver has been handed what it perhaps deserves, weak design that wouldn’t even make the qualifying round for a design Olympics, if there were such a thing. Feminine hygiene packaging. That’s what this is. Both the busy design above and the dreadful Welcome to Vancouver signs below. Weak by any standard. To see Olympic design actually done well, see Munich and Mexico City. 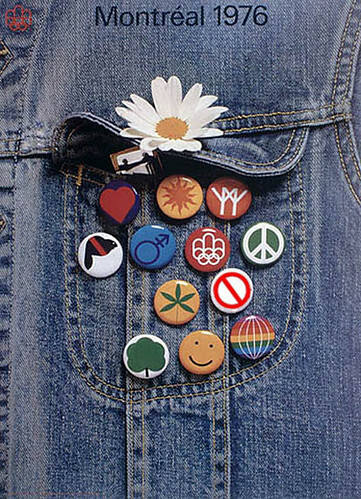 If you want good Olympic design, look only between 1968 and 1976 in cities starting with M. Also, Denver was in the running for the 1976 Olympics and had quite a nice campaign going, designed by eminent designer Massimo Vignelli (think old NYC subway guide). 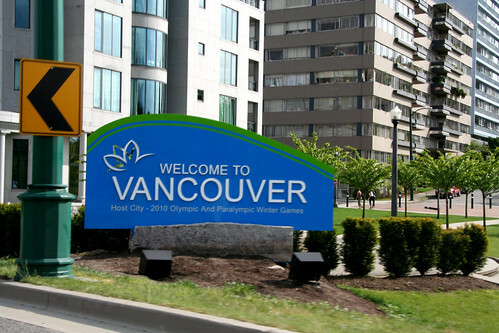 Tags: 2010 Olympics, bad design, cheesy, City of Vancouver, clip art, cringe list, design disasters, Douglas Coupland, feminine hygiene, graphic design, Illustrator, Massimo Vignelli, Montreal, Olympics, tracing, Vancouver, VANOC, why are things so boring now? This entry was posted on Sunday, October 18th, 2009 at 9:00 pm	and is filed under art, British Columbia, Canadian design, cities, cringe list, design, graphics and signage, Vancouver. You can follow any responses to this entry through the RSS 2.0 feed. You can leave a response, or trackback from your own site. The Olympics are self destructive. With the threat of global warming we cannot afford such flagrant displays of excess and overconsumption. The best way to avoid 300,000 tons of emissions is for people to simply stay at home. 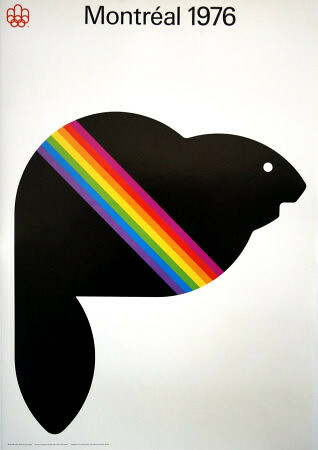 that rainbow beaver is ace!!! …and I love your outrage. thanks for the laughs. Traced photographs…over rendered…awful! A real step back in design. Look at the graphics from Turin. Very stylized…done by folks who could actually draw!!! These make Canada look very UNHIP!!!!! John, thank you for the backup. Every time I see one of these graphics – and they are everywhere now – I just cringe. There’s also the 2010 logo, which I didn’t show here but will include in another post. It’s an Inuit inukshuk sacrilegiously made into a cartoon person, without any acknowledgement of the fact the Inukshuk has little to do with Vancouver or even British Columbia other than that there’s one downtown. Not a shred of critical thinking or design sense has gone into these games, from start to finish. The 3 furry mascots are a lot better, I admit, but they too play fast and loose with quasi-faux-First Nations mythology, and I’d take the Montreal 76 Amik beaver mascot over them any day. I work at the airport and I am sick, sick, sick of the overwhelming, overbearing 2010 graphic plague. We’ve got Samsung being rammed down our throats everywhere we turn. Worst of all is the female wheelchair curler, who looks like she is either psycho or seriously depressed. I will be glad never to see blue and green together again. Wow, that last one looks like bad CGA graphics from some 1983 computer game. Shallow comparison. I’m glad you all liked the montreal “middle finger over the olympic rings” logo and the gay beaver mascot over vancouver’s graphics. 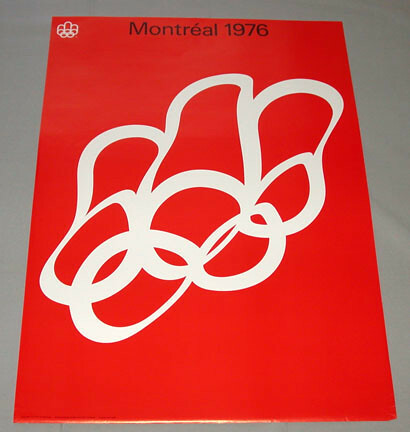 the best olympic graphics came from munich, montreal pretty much copied and adapted that four years later. you voting against these olympics means you voting against canadian hockey. traitor to the nation. Lordy. “Gay”? “Traitor”? Homophobia AND primitive nationalism all in one statement! We don’t have “traitors” in this nation, criticism is allowed, but your homophobic trolling has got you banned from commenting here.